You are invited to the November concert "Festival Brikcius" - CELLO AND PIANO II., of Italian pianist Giuseppe Devastato, who is living in Madrid, and Czech cellist František Brikcius, held on Thursday 21st November 2013, 7.30pm, at representative concert hall from the 13th century, the Stone Bell House (GHMP, 3rd floor, Staroměstské náměstí 605/13, Praha 1, Czech Republic). Both musicians will play second part of compositions for cello and piano. You will hear 5 Stücke im Volkston and Fantasiestücke by German composer Roberta Schumann (1810 - 1856), Klid and Rondo in G minor by Czech composer Antonín Dvořák (1841 - 1904). As a special encore they will perform Presto by Czech composer Leoš Janáček (1854 - 1928). Concert is a "preview" of the forthcoming Year of Czech Music 2014, celebrated by "Festival Brikcius" in 2014. 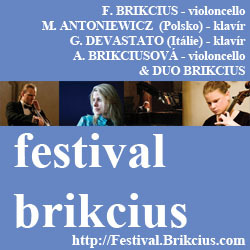 The next autumn concert "Festival Brikcius" - CELLO DUOS II. (Duo Brikcius: Anna Brikciusová - cello & František Brikcius - cello) will be held on Thursday 19th December 2013. Tickets are exclusively available through official festival ticket sales Prague Ticket Office - Via Musica (http://www.PragueTicketOffice.com - Via Musica, AMU, Malostranské náměstí 14, Praha 1 - Via Musica, Staroměstské náměstí 14, Praha 1 - Tel. : +420 224 826 440), Ticketon.cz and cca 90 minutes before every concert at the door (details here). Full entry fee: 40O CZK (advance ticket sales 380 CZK) / student and senior over 65 years: 200 CZK (advance ticket sales 180 CZK). Due to the limited number of seats we strongly recommend early booking. "Festival Brikcius" - the 2nd chamber music concert series at the Stone Bell House in Prague (Spring & Autumn 2013), that commemorates 100th anniversary of the birth of the British composer Benjamin Britten - BRITTEN 100, 100th anniversary of the birth of the Polish composer Witold Lutosławski - 100/100 LUTOSŁAWSKI, 140th anniversary of the birth of the German composer Max Reger and 170th anniversary of the birth of the Czech cellist and composer David Popper and Daniel Pearl World Music Days, is held under the auspices of the Mayor of Prague 1 Oldřich Lomecký, the Councillor of the City of Prague Václav Novotný, the Ambassador of the Embassy of Italy in Prague H. E. Pasquale D'Avino and in the cooperation with the Prague 1 and the City Gallery Prague at the Stone Bell House, Old town square in Prague. Concerts are held every 3rd Thursday of given month at 7.30pm. Further details on websites http://Festival.Brikcius.com , http://www.Brikcius.com , http://www.GiuseppeDevastato.it , http://www.GHMP.cz , http://www.Praha1.cz , http://www.FaceBook.com/FestivalBrikcius , http://www.FaceBook.com/Brikcius.Frantisek & http://www.Twitter.com/Brikcius . 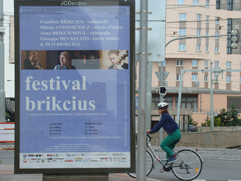 "FESTIVAL BRIKCIUS - CELLO AND PIANO II." Thursday 21st November 2013, 7:30pm, The Stone Bell House (GHMP, 3rd floor, Staroměstské náměstí 605/13, Praha 1, Czech Republic). Competition: Win 1 x 2 concert tickets for the December concert "Festival Brikcius" and 1 x CD "The Neapolitan Masters"
When is held Christmas final concert "Festival Brikcius", featuring siblings cello ensemble Duo Brikcius? Contest is over, lucky winners are D. D. from Doksy and E. B. from Prague 10. "Festival Brikcius" tickets are available here . Prizes for the CZECH CELLIST FRANTIŠEK BRIKCIUS NEWSLETTER (Nr. 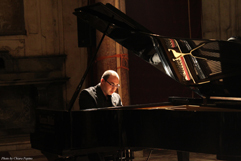 44, November) are provided by "Festival Brikcius" and Italian pianist Giuseppe Devastato, November guest of the "Festival Brikcius"
I legami tra l'Italia e la Repubblica Ceca hanno radici antiche. Con la nascita della Congregazione Italiana di Praga, a Mala Strana nel 1573, nei locali che oggi ospitano l’Istituto Italiano di Cultura, si può' fornire una prima importante connotazione temporale a quella plurisecolare rete d'interscambi che accompagnano il cammino dei nostri rispettivi popoli. Un cammino accomunato non solo dall'amicizia e dallo spirito libertario maturato attraverso affini vicissitudini storiche, ma anche da una ricerca sapienziale che da sempre declina le molteplici forme della bellezza. Su questa tradizione si colloca a pieno titolo il Festival Brikcius, una celebrazione del bello musicale ed un tributo corale che la Repubblica Ceca e l'Italia rendono all'Europa dei popoli. František Brikcius: Mr. Devastato, you were born in Naples, but you live in Madrid. How would you compare music life in both cities? Giuseppe Devastato: Yes, I’m born in Naples, the Capital of Music for three hundred years and now I’m living here in Madrid. Both cities are very interesting, but the music culture is different, Naples had a big tradition about the famous Neapolitan School, we can remember some composers as Scarlatti, Durante, Cimarosa and Pergolesi. Just to find something in common, Scarlatti lived in Madrid the last part of his life. The Spanish music is passionate but in comparison with the Italian history and tradition it has still very young roots. F. B.: You recorded many movie soundtracks for the film industry, for television and radio stations in Europe and America. Tell us something about it. G. D.: I recorded soundtracks for Warner Chappell Music, CAM and Rai5, playing the piano part myself during the recording sessions, it was both an amusing and constructive experience. They wanted me at the piano because of my personal sound, close to the Arte del Bel Canto. I also admire the Italian tradition in film music, hold by Nino Rota and Ennio Morricone, they wrote first as classical composers and then started to collaborate with the greatest Italian directors, such as Federico Fellini, Luchino Visconti and Sergio Leone. F. B.: You are solo pianist, as well as composer and pedagogue. How do you manage it all? G. D.: I had a very good Maestro, Carlo Alessandro Lapegna, he taught me many values of life and love for music. I come from the tradition of the Neapolitan School, founded by great masters, and since then in addition to music, it was extremely important the respect for themselves and for others. I think a complete musician should be a good instrumentalist, know the elements of composition and be a good teacher. Personally I try to implement this philosophy with my hard work, putting myself first at the center of criticism in order to learn first from my mistakes. 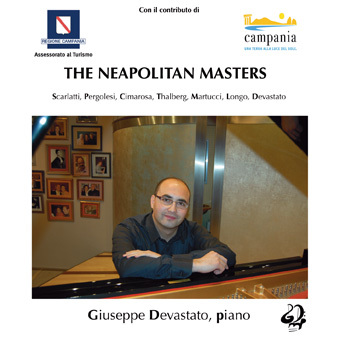 F. B.: You recorded CD "The Neapolitan Masters" featuring music written by composers from Napoli. Who are they? G. D.: At the time of the American Revolution, Naples was the center of the musical world. For more than a century the Neapolitan School of Music dominated the entire musical scene of Europe. When Thomas Jefferson made a catalog of his personal music collection in 1783, it featured names like Piccinni, Hasse and Pergolesi, all important composers trained at the famous music conservatories of Naples. Although the Neapolitan Masters laid the foundation of classical music and produced some of the most beautiful music ever written, only a fraction of their masterpieces are known and performed today. The principal goal of Neapolitan Music Society is to enlarge communities of study, research and a reevaluation of these musical works, forgotten or lost for over two centuries. The Neapolitan Masters were the most famous classical musicians of the 17th and 18th centuries. They were hired and traded, Gjerdingen says, "like star baseball players between the competing royal courts in Europe." My mission is to reintroduce the Neapolitan Masters to a new audience through concerts, recordings, presentations and Master Classes. Our hope is to rewrite the history that has distorted the contributions and one hundred year history of the Neapolitan Masters. I presented my CD all over the world, with two world première by Pergolesi and Longo; you can get more information in my official web site: http://www.GiuseppeDevastato.it . F. B.: On December 9th, 2011 you were awarded with the "International Prize Cartagine" to human merit and professional achievements in the "MUSIC" section, for the dissemination of music in general - and Italian music in particular - around the world, in virtue of the merits acquired as a pianist and composer, with the intention to spread the world of classical music: "His actions show high sensitivity and a deep love for life. His playing is intended to imitate the human voice and is inspired by the art of Bel Canto of the Neapolitan School". Did it affect your professional career? G. D.: For me it was a surprise and a big honour to receive this important Prize, of course I had the possibility to present my project with more credibility, but beyond that I continue on my way and with my mission. 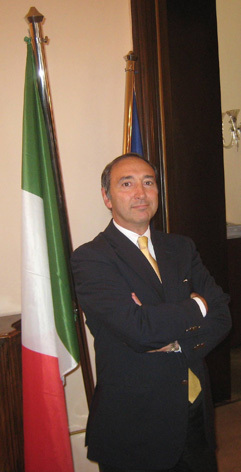 F. B.: You are the artistic director of the "Neapolitan Music Society" of New York. What is the purpose of this cultural institution? G. D.: The Neapolitan Music Society, by its active support of research, performance, education, and preservation, seeks to promote and give renewed voice to the lost musical masterpieces of seventeenth- and eighteenth-century Naples. Through collaboration with arts organizations, foundations, and educational institutions, we strive not only to introduce new audiences to the "Neapolitan School" but also to train future generations of musicians in this glorious tradition. F. B.: Recently, you returned from concert tour in China. What did you like there most? G. D.: Very nice country, people are fantastic! I gave concerts, Masterclass and I was in jury as President for an important piano competition. I think this country could be very soon the future of music, they have a lot of theatres, concert halls and the desire to know and learn from the West. I had an amazing welcome and now even a fan club! F. B.: On Thursday 21st November 2013, you will play music by Robert Schumann, Antonín Dvořák and Leoš Janáček in Prague. What are your future plans? G. D.: After this performance, I will play in December some recitals in Poland and Italy presenting my CD "The Neapolitan Masters" in collaboration with the Italian Embassy and Cultural Institute. Next year I will go to China for my second tour, then I will perform in Carnegie Hall and United Nation presenting my composition in World Premiere for Violin and Piano dedicated to "Tsunami Victims". My tour will continue in Japan and South Korea and I'm working on a new CD which will be released in 2014. F. B.: Steinway or Bösendorfer? G. D.: Very difficult to answer, we are talking about two beautiful instruments. Let's say that I prefer Bösendorfer because it is close to my way of thinking and playing and sounds like a human voice. G. D.: I like compose by pen but sincerely today it is impossible, because if you want to respect the production times it’s more simple to use a computer. I’m using both Finale and Sibelius. G. D.: Last July I presented my composition for Soprano, Choir and Orchestra here in Madrid; it is named "Sorga il Vessillo" and it’s dedicated to the important Czech painter Dimitrij Kadrnozka to celebrate his birthday! The concert was held in the theatre "Ateneo of Madrid" at the presence of Mr. Kadrnozka and the President of Czech Institute of Madrid. This composition has as its text a tribute to the Knights of Malta and music is written using some masonic elements. G. D.: Thank you too and I can’t wait to play with you! 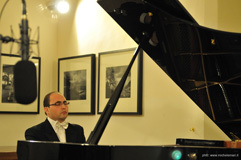 For more information about Italian pianist Giuseppe Devastato visit http://www.Brikcius.com , http://Festival.Brikcius.com , http://www.GiuseppeDevastato.it , http://www.FaceBook.com/pages/Giuseppe-Devastato/158712600952559 , http://www.ReverbNation.com/GiuseppeDevastato and http://EN.Wikipedia.org/Wiki/Giuseppe_Devastato . You are invited to the poetry reading "Brikciusová Na Prádle - Labyrint", from the work of Anna Brikciusová in the interpretation of Jan Židlický and accompaniment of cellist Anna Brikciusová, held on Saturday 16th November 2013, 6pm, at the kostel sv. Jana Křtitele Na Prádle (Říční ul. 6, Praha 1), as a part of the 15th Poetry Day Festival. Free entry. Main purpose of the Poetry Day Festival is raising awareness of the poetry. This festival is annually held to commemorate the birth of the Czech poet Karel Hynek Mácha (*16th November 1810). For more details visit websites http://www.Brikcius.com , http://www.DenPoezie.cz , http://www.FaceBook.com/Brikciusova , http://Twitter.com/Brikciusova and http://www.Husiti.Majestat.cz .